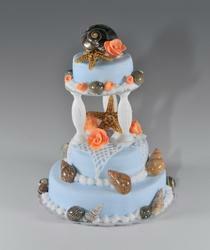 This is a 3 tier blue ocean shell cake. It comes with white pillars and orange roses. A white net and ocean shells completes this special cake. It can be sliced if you so choose displaying layers of cake and icing.